You won't walk far in a churchyard before you find a headstone with something wrong. Place names, dates, spellings, even the date of the death. Were people sloppy in their work in the past? Or are we just being picky? 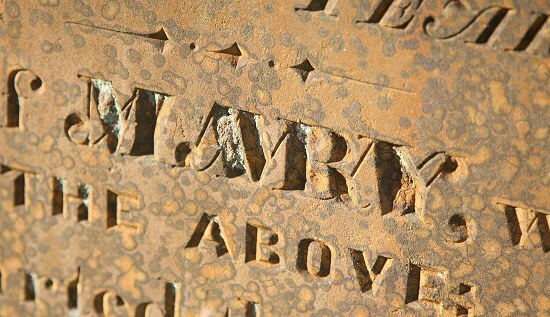 Only after I learned to carve lettering on stone did I start looking more carefully at headstones. To be fair to the past, the spelling of place names and even people's names was not fixed. There was no rule, but one spelling generally rose to the top of the pile and became the 'right' way to spell the word. Sometimes though, the letter carver just got it wrong and we can see the evidence. This site records a few of the errors I have seen and how the letter carver tried to deal with the problem. I also point out the techniques letter carvers used to hide or fix their errors, some details of lettering styles through the years and I make occasional notes on the churches themselves. The menu at the top takes you to the churches I have visited and some of the things I have seen. The panel on the right shows what I have done recently. Feel free to tell me what you think. You can now buy a piece of Frank's lettering, right here. The list of stock pieces changes over time as pieces arrive and leave. Check the Shop page now to see what is available. Parental Advisory: There are arses. Church Latest: My last work contract was in Loughborough so I managed to get out to see some of the local churches. St Mary and St Hardulph, Breedon on the Hill is a windy, exposed spot. 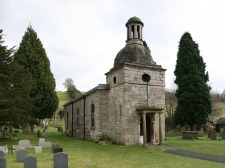 Go there on a warm day; All Saints, Loughborough had cultural vandalism and underground lettering; St Bartholomew, Quorn has some lovely Swithland slate and explosions in a quarry; St Leonard, Swithland has some very early slates named after the village. 22/06/16: Nobody gets out of here alive. Nevertheless, you can call me a rebel if you like, but I'm not having a funeral. Church Latest: All Saints, South Wingfield. Some impressively bodged modern stonework and a man who is careless what thou Sayes of me. St Peter and St Blaise, Somersal Herbert. Twins with different surnames and different again from their parents. St Andrew, Radbourne, with the dog forever pulling at his sleeping Lady's robe. 14/04/16: St Giles, Matlock; St Mary's, Mappleton, Derbyshire. Headstones are often beautiful and often touching, rarely both. Ann Tunnicliff is an exception. Also Mackworth which has the headstone that Longford's Hannah should have had, by the same hand, but with no mistakes.